Read the article below from Gary Perry, Technical Director for Altecnic, on the importance of servicing TMVs and answer a simple question at the end for your chance to win. ‘The right mixing valve is not a matter of choice. The application chooses the valve you need but the challenge is identifying the risks in a given installation. Thermostatic Mixing Valves (TMVs) were developed in response to the need for water storage at high temperature to prevent contamination with legionella and other waterborne bacteria. This water is typically stored at around 60oC and that could cause life-changing injury or death if a shower, bath or other outlet discharged it directly onto skin. Altecnic is a market leader, providing TMVs in a number of forms, depending on the application and relevant legal requirement. The legislation is quite specific; Building Regulations require the supply of water to a bath, for example, to not exceed 48oC and the obligation for compliance falls upon the installer. To assist in the selection process, TMV2 and TMV3 accreditations were created to provide solid criteria for designing a system that ensures user safety. Altecnic was first to market with Caleffi’s Careflo, a TMV3 rated valve. Following on from this, Altecnic introduced the TMV2 accredited MixCal series, which is designed and manufactured in Europe by our parent company, Caleffi, again placing us at the forefront of compliance. TMV2 provides adequate protection in domestic environments, but for commercial or higher risk applications such as medical and care facilities TMV3 is the benchmark. These valves respond quickly by shutting-off water flow completely if the cold water supply fails or output temperatures exceed the desired level. 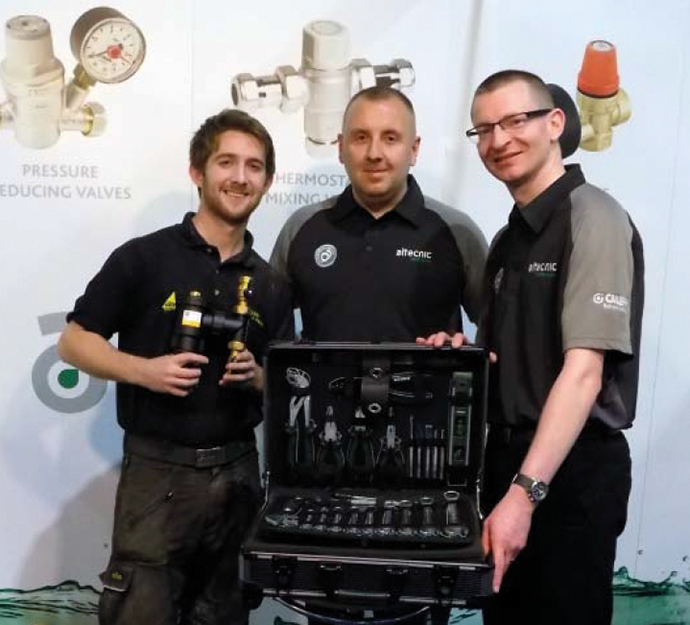 Altecnic was the first to market with a TMV3 accredited valve. These valves are independently tested, verified and subject to ongoing checks by BuildCert. To meet and exceed the standards of both TMV2 and TMV3, Altecnic, together with Caleffi, introduced the innovative 5213 series of mixing valves. This means that engineers can now specify a single series of valves that will be compliant with the requirements of multiple applications. 1 – Check mixed water temperature. If a variance is noted from the target range, then the valve must be serviced. 2 – Isolate and remove the valve. 3 – Referring to manufacturer’s guidance, carefully open the valve to expose the thermostatic element, flow convertor and shuttle. 4 – Remove, including any spring components, being careful to avoid damage. 5 – Check and replace O-rings, lubricating before replacing. 6 – Rebuild and fit serviced valve before returning to step 1. The growth of high-temperature water storage, especially solar or solid fuel heating, requires additional tempering protection. The Distribution Tempering valve Control (DTC) Scheme approves valves that are compliant with EN15092 and will reduce water temperatures to under 60oC. The Altecnic DTC approved 5218 series of valves, another first to market, reduces excessive temperatures from potentially uncontrolled heat sources, so that other terminal safety devices, ie TMV2 valves, can operate safely. COMPETITION – To enter the free competition, e-mail [email protected] with the answer to the following question – ‘Which accreditations does Altecnic’s 5213 Service of TMVs hold?’.